One of the single biggest problems with rectification is the astrologer's subjectivity. As soon as we make a decision based on our own astrological interpretations, we are projecting our own chart onto the person and so will see our astrological opinion of the client rather than the client's internal reality. One of the important points of Graphic Rectification is that the astrologer is eliminated from the process as much as possible. In addition, pressure can be removed from the astrologer's shoulders if the actual quest for the birth time is abandoned. 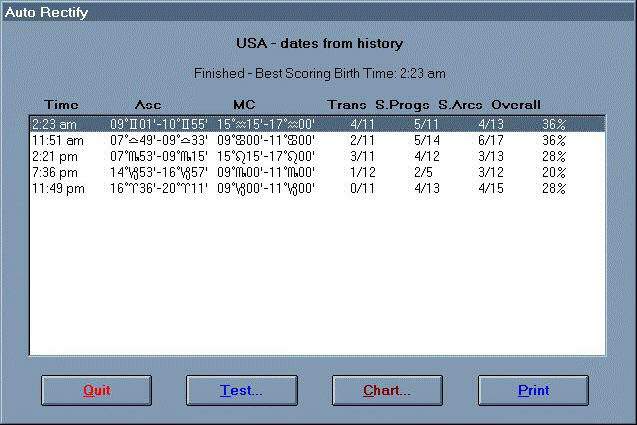 This may seem a strange comment, but if you can approach a rectification not trying to find the birth time but rather the chart with which one can work for predictive reasons, you have a better chance of success. One would like to think that the chart which is yielding good predictive results is also the birth time, but in most cases the astrologer and the client will never know and thus I feel it is better to let go of the "birth time" hunt and concentrate on finding a chart that has been generated by the client's history. For that is exactly what graphic rectification is best at, letting the client's history create a chart. c) The degree positions of all the planets are then plotted on a graph. A graph can be created with the x-axis numbered 0 to 29 and the y-axis being the number of times a particular degree receives a hit. So with the above, the planetary degrees 29°, 28°, 22°,18°, and 9° would all receive one hit, but 24° would receive two. You will need to round off each planetary position to the nearest degree. (In this example I have taken whole degrees for the sake of clarity.) This must be done in a consistent manner throughout the construction of a single graph. When doing a graph by hand, take into account whether a planet is moving retrograde or direct -- in other words, to which whole degree is the planet applying? In the software JigSaw, designed to create these graphs, there is no rounding off as the graphs are created working with 15' slots with a floating mean. For an exact date, as in the example given, seven units (degree positions) can be entered on the graph. However, some dates may not be exact. The client may simply remember that the event was some time in the middle of September, 1968. In looking at the ephemeris again you can see that in that period of time Mars moves from 21° to 29° Leo, Jupiter moves from 16° to 19° Virgo but all the other planets seem to stress just one possible degree in that two-week period. So in that case we can still plot the positions of Pluto, Neptune, Uranus and Saturn plus the node, which gives 5 units of information for the graph. The less accurate the date, the less data for you to plot However, it is far better to have less data than to take a guess at the date and therefore potentially have incorrect data. For good results a graph containing about 80 to 100 units of information is required. This usually means that you need about 15 dates from the person's life with the majority of them being exact. In graphic rectification the actual dates are directly responsible for the shape of the graphs, so the type of dates that you use will give you a graph for that type of event. If, for example, you entered the date of every time you cut your finger, then the graphs would show you the sensitive degree points in your chart for "Finger Cutting". This could be a fascinating field of research but if you were trying to rectify your chart, you would get some very strange results. So the type of dates you use need to be "Angular" events. Events that will, hopefully, be connected to any one of the four angles. These are the years that stand out as being particularly good or difficult. Your client may not have any exact dates in these years, but you need to know these years for when you are looking at major transits over the angles and are deciding between one of several charts. Births of older siblings or parents are not acceptable, as the person was not born at that time and therefore, at least on the physical plane, the chart did not exist and thus could not be responding to transits. One could argue this point, but I have found that pre-birth dates do not help graphic rectification. The first grandchild is the beginning of the next generation and is usually a good date to use. Births of future grandchildren, unless they move into the home or are very important in some way, are best left out. Any death that changes the person's household situation, such as a member of the household dying. Any death that brings grief into the person's life, not sadness for a few weeks, but real grief. However, the person's death itself does not seem to be a valid date for rectification. Marriages /Divorces: the beginnings and/or endings of committed relationships. Relationships always have several dates around them. Valid dates are when the couple first met and when they got married or started living together with some form of commitment. Divorces also have several dates attached to them. The date when the couple split up, as well as the date of the legal divorce are both valid. Someone else's marriage is only valid if the person leaves the home of the client as a result of the marriage, for example, if the client's daughter who has previously been living at home, leaves to get married. Motor accidents that result in loss of property but no serious injuries are not valid dates. Primarily we are looking for Ascendant transits. The first house, among other things, is the house of the physical body, so any event where your body is accidentally injured, or cut into, or not functioning well due to ill health is a valid date. Travel which has changed the person. Generally the best dates are the first overseas trip, or first time the person encounters a different culture. Travel is also relevant to the peer group and life style. If the person is the only one of their "tribe" to visit the city which is only 20 miles away, then that city visit is a valid date. However, if flying to London or New York is a regular feature of the person's life, then those dates are not valid. Major job or career changes. These are changes to the social status -- MC dates. If the person changes jobs often or moves from one type of job to another job which is basically identical, then those sorts of job changes (4) are not valid dates. In addition, when a child starts school, they are changing their standing in the family and within their circle of friends, and this is an MC type of date. This may be moving around the corner or to the other side of the world, but if it was a big move for the person's household, then it is a valid date. The times the person has excelled. This could be almost anything: starring in a school play, or winning a Nobel prize. Whatever the event, as long as it is a peak in the person's life, it is a valid date. Sometimes there are events of which you may be unsure, but as long as they are important to the individual and can be linked to one of the angles, then you can use them. Spiritual experiences, insights, and great moving moments are wonderful things, but are not the components of outer planets to the angles, and have proven to be invalid for graphic rectification. Dates should span the life. We are looking at the movement of outer planets through a person's chart, and therefore the best and clearest graphs are gained from a set of dates which span the life. For example, a few dates in childhood, a few more in adolescence, with the frequency of dates increasing in adult life. If a person is 50 and all of the dates are in the last 15 years of the current life, then you are getting an unbalanced picture of the outer planetary transits. Similarly, it is advisable to have no two dates within six months of each other, for dates that are close together are merely duplicating the same outer planetary transit. In addition, if the person is young, pre-Saturn return, then he or she has not lived long enough to have a reasonable number of outer planetary transits, and generally the graphs are not that valid for rectification work. When looking at the graph realize that the peaks of the resulting graph are the most sensitive degree points in the person's chart, as these were the degrees most consistently receiving transits when the events were occurring. For the location of birth is it possible to have an Ascendant of, say, either 10°, 14° or 26° of any sign while at the same time having an MC of either 10°, 14° or 26° of another sign? This can result in anything from one or two possibilities to up to ten or twelve, depending on the number of peaks and the geographical location. Charts are then constructed for the possible sets of angles, and individual outer planetary transits are checked -- primarily by conjunction only -- against each chart. The sets of angles that show, in terms of life events, no response to outer planets moving over them are discarded. This process usually reduces the list to a few options. The remaining charts are examined not only for events occurring at the times of major angle transits but also the right type of event. What the astrologer has then found is a rectified chart. This may or may not be the correct birth time for the client, but it is the chart that is proven to be working in the person's life, and therefore can be relied upon for future work. An interesting example to also explore is to look at key dates from the “life” of a country, in this case the USA, to see if the resulting graphs support any of the many charts debated. For graphic rectification can be used not only for people, but just as easily for countries. It should be noted that the point of this exercise is to give an example of graphic rectification, not to offer a suggestion as to the “correct” chart for the USA. These dates were chosen because of their major influence on either the people or the identity of the country. Dates number 2 and 3 are too close together, and thus you would only work with one of them. It would be your choice as to which one to drop off the list. In this example I eliminated the date for the abolition of slavery. Also dates 17 and 18 are too close, so I have chosen not to use date 17. Figure 1. Geocentric graph of USA dates (from JigSaw 2). An extension of this method is to not only construct a graph using Geocentric positions, but to also construct a graph using Heliocentric positions of the planets for the dates. 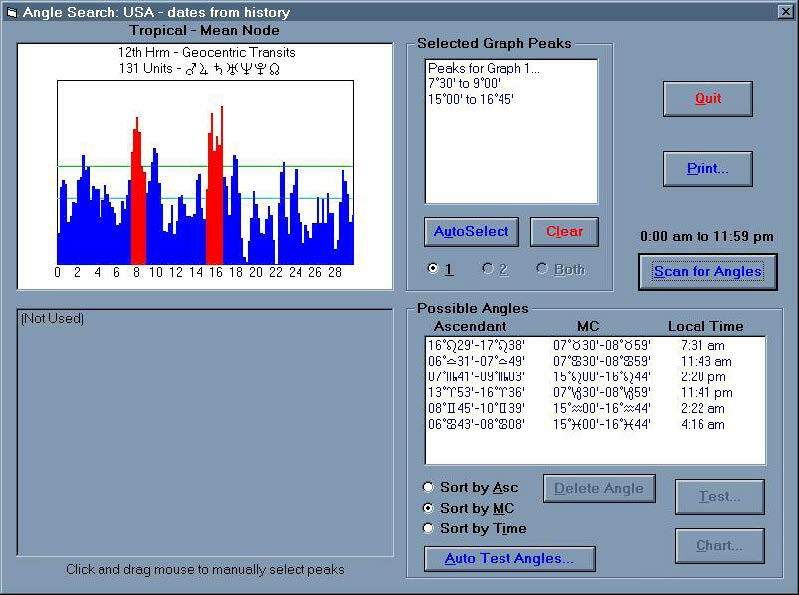 Figure 2 is a screen from JigSaw where both a Geocentric and a Heliocentric graph of the USA dates has been constructed and then compared. As you can see, the results are similar with five sets of possible angles given: 7° Libra, 7° Scorpio, 14° Capricorn, 16° Aries, 9° Gemini. The comparison of graphs helps to ensure that the strongest possible peaks and therefore zodiacal sensitive points are found. Figure 2. Geocentric and heliocentric Graphs compared for USA dates (from JigSaw 2). Once a list of possible angles is found, then the astrologer must either by hand or by computer check each possible set of angles for transits, secondary progressions and Solar Arcs to see which sets of angles are the most sensitive as well as yielding the correct symbolic events. 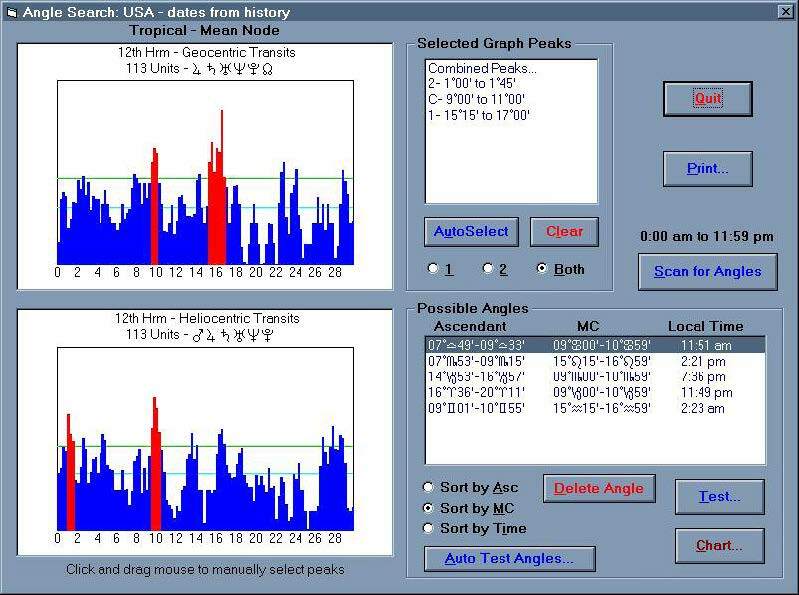 Figure 3 is from JigSaw 2 showing the results of checking each set of angles for the timing of a transit, progression or solar arc event to the different sets of angles compared with the timing of the events in USA history. Figure 3. Checking each set of angles for sensitivity to Transits, Progressions and Solar Arcs (from JigSaw 2). Here the Ascendants of 9° Gemini and 7° Libra are proving to be more sensitive than the other possible combinations. It is interesting to note that this list contains the Gemini rising chart supported by Jim Lewis in his book The Astro*Carto*Graphy Book of Maps and the Scorpio rising chart cited by Nick Campion on page 303 of The Book of World Horoscopes and the Libra rising chart that he cites on page 296. The Gemini rising chart: When Pluto conjuncted the IC, the Korean War occurred, and when Neptune conjuncted the Descendant, the Vietnam War ended in defeat for the USA. When Uranus conjuncted the Descendant, the USA purchased Hawaii, and then when Uranus formed a conjunction to the IC, they bought Alaska. The Libra rising Chart: When Neptune conjuncted the Descendant, Lincoln was assassinated. Transiting Uranus on the Descendant timed the 1930s stock market crash. One can see that there is a very strong case for the Gemini rising chart for the USA. However, this article is not a detailed study of that country's chart. Rather, I have simply used the USA as an introduction to this method of rectification. There are many other uses of the graphs apart from rectification. You may know your birth time, but when you plot the graph you acquire a peak that does not make sense of your chart. This point may not fit any known astrological point, but what you have found is a peak or rather zodiac degree that is sensitive to transits. You may have a list of dates or times when you have been lucky. By plotting those dates on a graph in the same manner as for rectification, you will find the sensitive points in your chart for transits which bring luck. I know of a jockey who has plotted all his wins onto a graph, so now he can watch for planets reaching his key peak degrees and know when he is likely to have his winning patches. The uses are endless, with rectification being just one of the graph's functions. Graphic Rectification is not a wonder method that will always work, but no matter what result you get, if you have put in sensible dates, then you will acquire a chart that will work for predictive reasons because it has been created from the client's history. Once an astrologer has created a graph of the events, be they a person's or a country's history, then that astrologer knows that the peaks on the resulting graph are the sensitive points in the zodiac for that person, country or stock market event. The astrologer can then work with those degrees confident that they have been found without the unconscious expectation of the astrologer influencing the results. See “The Number and Type of Dates Needed” below for a full explanation of the type of dates that are valid. You may use either the true or the mean node as long as you are consistent for a given rectification. Bernadette Brady is the inventor of the Graphic Rectification method, which is implemented in the JigSaw computer program co-authored by her and Graham Dawson and available from Astrolabe. She is also a co-author of the Starlight computer program for the study of fixed stars, and author of the books The Eagle and the Lark (now titled Predictive Astrology), Brady's Book of Fixed Stars, Star and Planet Combinations and Astrology: A Place in Chaos, most of which are also available from Astrolabe, on our books page. She holds a masters degree in Cultural Astronomy and Astrology from Bath Spa University, UK, and is currently reading for her doctorate in determinism in Western astrology at Bath Spa University. In addition, she is a tutor for the MA in Cosmology and Culture at Lampeter University, Wales. She is also a Fellow and Diplomate of the Federation of Australian Astrologers, and a faculty member of the Astrological Guild of Educators International. In September, 2006, Bernadette Brady received the Astrological Association of Great Britain's prestigious Charles Harvey Award for exceptional service to astrology, and in Denver, CO, in May, 2008 she received the United Astrology Conference's Marion March Regulus Award for Theory and Understanding within the field of astrology. This article is from her website, www.bernadettebrady.com, and is used by permission.